"Counting calories and getting the macros spot on is pretty damn hard!" "I've never pushed myself this hard." "I'm working hard to balance out healthy eating habits and exercise habits." "I have been trying hard to keep the faith. I've only dropped 2 lbs in 4 weeks." "Hard work is really paying off!" Sound familiar? Can anyone relate? I'm a stubborn, overthinking, thick-headed, bull-in-a-china-shop kinda gal. Don't be fooled by the smile on my face; I'll find a way to overcomplicate or make things way harder than they need to be. 1. Sometimes I'll walk over to the café across my work and order a "teriyaki chicken with no rice, no veggies, no teriyaki sauce, no hot sauce". The cashier will usually ask, "So just chicken?" 2. The other morning I was feeling fragile, like a glass vase that fell on the floor and broke, shards everywhere. I tried identifying the thoughts in my mind that made me feel crappy. I tried deep breathing the feelings away. I tried watching baby animal videos for distraction. None worked. What did? Sitting and doing nothing. 2-3 minutes later I felt better. 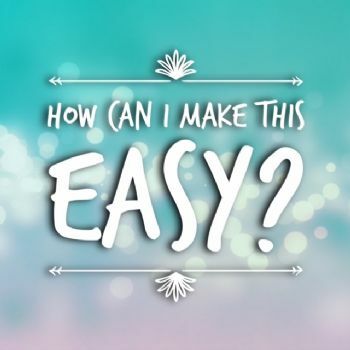 Instead of making things hard, how can you make things easy? Less is always MORE! ALWAYS!